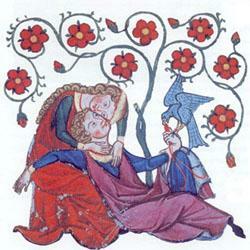 This seminar goes back in time to Medieval France to discover origins of the Western concept of romantic love. Our discussions explore historical, cultural, and symbolic aspects of Arthurian tales of romance and chivalry by Chretien de Troyes, lays by Marie de France, and a feminist manifesto (of sorts) by Christine de Pisan. All readings are in English. Evaluation will be based on active participation and a critical analysis, to be presented orally and also submitted in written form. The critical analysis is a scholarly presentation and as such must demonstrate original thinking about and specific references to one or more of the texts and topics studied in the seminar. The written document will be approximately 10 double-spaced pages and follow one of the following style formats: MLA, Chicago, or AP. "Holy War in The Song of Roland: The 'Mythification' of History"
Read about the rote, a medieval string instrument, here. To explore the Project Guttenberg website, click here. 1. Outline the broad lines of the story. 2. Medieval society depended on oath and fidelity. Giving one’s word represented a morally binding contract. Breaking one’s oath was a serious, punishable fault. It violated the code of conduct between lord and vassal and between knight and lady, and represented a tear in the fabric of society. Identify examples of how this is demonstrated in Marie de France’s Bisclavret. 3. Discuss the role of oath and fidelity in today’s world. In your opinion and experience, does giving one’s word carry moral obligation in our culture? Explain your viewpoint. 4. Medieval society also greatly valued mesure: moderate, balanced behavior based on reason. Identify examples of how this is demonstrated in Marie de France’s Bisclavret. Consider passages that show mesure as well as passages that show a lack of it. 5. 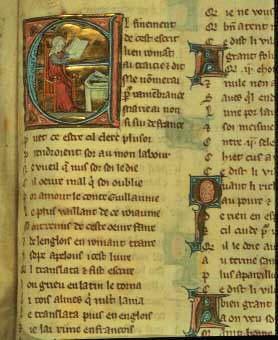 Examine the roles of language and gesture in Marie de France’s Bisclavret. Identify passages where language fails and where gesture succeeds. Discuss how these passages reflect the medieval emphasis on oath and fidelity. 6. The metamorphosis of Bisclavret in the lai is paralleled by the metamorphosis of his wife. Discuss the two representations, referring to specific passages in the lai to illustrate your remarks. 7. Consider the final outcome of the lai: Bisclavret is reintegrated into society, while his wife is cast out. How do you interpret this outcome? 1. Calogrenant’s story (beginning of tale): Why does Chrétien begin with this? 4. Yvain's descent into madness upon realizing he hasn't kept his promise: Describe his state as a "wild man"; examine his relationship with the hermit; relate his encounter with the lion being attacked by a serpent. 4. The battle episodes: What are the parallels between them? How are they different? What are Yvain’s motives in each? 5. The need for balance between a knight’s obligations to the chivalric code and to the code of courtly love: How is this represented? 6. The role of Christian ideals in this story: Where and how are they represented? This is a romance, a male "how to" guide for finding balance between love and duty. Think about how the representations differ from those of Marie de France in her lais. With what do you agree? With what do you disagree? Prepare your ideas for class discussion. For next week's class: 1) Read excerpts from The Book of the City of the Ladies. Online here; pdf provided below. 2) Note your reactions. 3) Prepare a written paraphrase of the reading. For next week's class: Read Natalie Zemon Davis' foreword to The Book of the City of Ladies (handout), noting ideas that catch your interest. Be prepared to share them in class. You may enjoy reading Christine de Pisan's poem, "The Song of Joan of Arc," the only popular work composed during the lifetime of "the maid of Orléans" (Joan). You can find it online here. 1. What is the tone of the text? How does Christine use that tone to make her points? 3. Discuss the author's choice of allegory to frame her ideas. Do you find it effective? Why or why not? 4. From Christine's perspective, which has a greater effect on women, gender or class? 5. Why do Lady Reason, Lady Rectitude, and Lady Justice visit Christine? 6. What are the individual functions of Lady Reason, Lady Rectitude, and Lady Justice? 7. What do Christine the Builder and Lady Reason say about women's education? 8. What does Lady Reason say about misogyny? 9. What does the text say about women's contributions to humanity? 10. Discuss your reaction to this text in comparison to the other texts we have studied during this seminar. You may enjoy comparing representations from our readings to those in Geoffrey Chaucer's "The Knight's Tale,"
translated by A.S. Kline. Read online here. Pdf provided below. 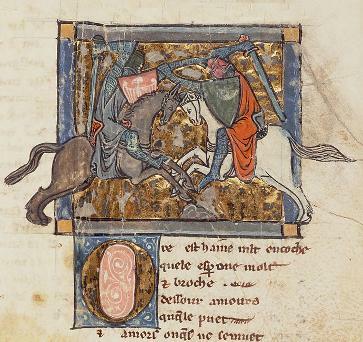 Yvain dueling with a knight. Image courtesy of Princeton University Librairies.